I’ve been finishing a large project, and this is the bibliography I’ve been keeping for the parts on public memory and rhetoric. It’s for the project, so it’s not exhaustive, but I think it’s a good collection of sources for someone interested in the area. Applegarth, Risa. “Children Speaking: Agency and Public Memory in the Children’s Peace Statue Project.” Rhetoric Society Quarterly 47, no. 1 (November 14, 2016): 1–25. Blair, Carole, Greg Dickinson, and Brian L. Ott. “Introduction: Rhetoric/Memory/Place.” In Places of Public Memory: The Rhetoric of Museums and Memorials, edited by Greg. Dickinson, Carole. Blair, and Brian L. Ott, 1–54. Tuscaloosa, AL: University of Alabama Press, 2010. Blair, Carole, Marsha S. Jeppeson, and Enrico Pucci Jr. “Public Memorializing in Postmodernity: The Vietnam Veterans Memorial as Prototype.” Quarterly Journal of Speech 77, no. 3 (August 1, 1991): 263–88. Bowker, Geoffrey C. Memory Practices in the Sciences. Cambridge, MA: MIT Press, 2005. Brooke, Collin Gifford. “Forgetting to Be (Post)Human: Media and Memory in a Kairotic Age.” JAC 20, no. 4 (2000): 775–95. ———. Lingua Fracta: Toward a Rhetoric of New Media. Cresskill NJ: Hampton Press, 2009. Bruner, Michael Lane. Strategies of Remembrance : The Rhetorical Dimensions of National Identity Construction. Columbia S.C: University of South Carolina Press, 2002. Carruthers, Mary. “Memory’s Room.” Teachers & Writers 30, no. 5 (1999): 1–4. ———. The Book of Memory: A Study of Memory in Medieval Culture. Cambridge, MA: Cambridge University Press, 1993. Carruthers, Mary, and Jan M Ziolkowski, eds. The Medieval Craft of Memory: An Anthology of Texts and Pictures. Philadelphia, PA: University of Pennsylvania Press, 2002. Casey, Edward S. “Public Memory in Place and Time.” In Framing Public Memory, 17–44. Tuscaloosa, AL: University of Alabama Press, 2004. Cicero, Marcus Tullius., and J. S. (John Selby) Watson. Cicero on Oratory and Orators. Carbondale, IL: Southern Illinois University Press, 1970. Connerton, Paul. How Societies Remember. Cambridge [England]; New York, NY: Cambridge University Press, 1989. ———. “Seven Types of Forgetting.” Memory Studies, 2008, 59–71. Crowley, Sharon. “Modern Rhetoric and Memory.” In Rhetorical Memory and Delivery: Classical Concepts for Contemporary Composition and Communication, edited by John Frederick Reynolds, 31–44. Hillsdale, NJ: Lawrence Erlbaum, 1993. ———. The Methodical Memory: Invention in Current-Traditional Rhetoric. Carbondale, IL: Southern Illinois University Press, 2010. Dickinson, Greg., Carole. Blair, and Brian L. Ott, eds. Places of Public Memory: The Rhetoric of Museums and Memorials. Tuscaloosa, AL: University of Alabama Press, 2010. Douglas, Mary. How Institutions Think. Syracuse, NY: Syracuse University Press, 1986. Doxtader, Erik. “Reconciliation—a Rhetorical Concept/Ion.” Quarterly Journal of Speech 89, no. 4 (November 1, 2003): 267–92. Edwards, Janis L., Charles A. Hill, and Marguerite Helmers. “Echoes of Camelot: How Images Construct Cultural Memory through Rhetorical Framing.” In Defining Visual Rhetorics, 179–94. New York: Routledge, 2004. Francoz, Marion Joan. “Habit as Memory Incarnate.” College English 62, no. 1 (1999): 11–29. Halbwachs, Maurice. On collective memory. Translated by Lewis A Coser. Chicago, IL: University of Chicago Press, 1992. Hariman, Robert., and John Louis. Lucaites. No Caption Needed: Iconic Photographs, Public Culture, and Liberal Democracy. Chicago: University of Chicago Press, 2007. Hasian, Marouf Arif. Rhetorical Vectors of Memory in National and International Holocaust Trials. East Lansing Mich.: Michigan State University Press, 2006. Haskins, Ekaterina. “Between Archive and Participation: Public Memory in a Digital Age.” Rhetoric Society Quarterly 37, no. 4 (October 1, 2007): 401–22. ———. “Locating Memory in an Age of Dislocation.” Journal of International and Intercultural Communication 9, no. 3 (July 2, 2016): 259–63. Hess, Aaron. “In Digital Remembrance: Vernacular Memory and the Rhetorical Construction of Web Memorials.” Media, Culture & Society 29, no. 5 (September 1, 2007): 812–30. Hutton, Patrick H. History as an Art of Memory. Burlington, VT: University Press of New England, 1993. Hutton, Patrick H. “The Art of Memory Reconceived: From Rhetoric to Psychoanalysis.” Journal of the History of Ideas 48, no. 3 (1987): 371–92. Huyssen, Andreas. Present Pasts: Urban Palimpsests and the Politics of Memory. Stanford, CA: Stanford Univ. Press, 2003. Irwin-Zarecka, Iwona. Frames of Remembrance: The Dynamics of Collective Memory. New Brunswick, NJ: Transaction, 1994. Ittersum, Derek Van. “Distributing Memory: Rhetorical Work in Digital Environments.” Technical Communication Quarterly 18, no. 3 (June 9, 2009): 259–80. Jasinski, James. 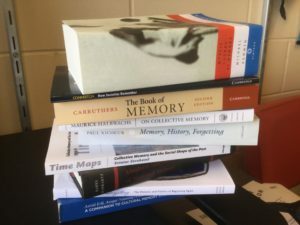 “Memory.” In Sourcebook on Rhetoric, 355–63. Thousand Oaks, CA: Sage, 2001. Kalin, Jason, and Jordan Frith. “Wearing the City: Memory P(a)laces, Smartphones, and the Rhetorical Invention of Embodied Space.” Rhetoric Society Quarterly 46, no. 3 (May 2016): 222–35. Kammen, Michael. Mystic Chords of Memory: The Transformation of Tradition in American Culture. New York: Vintage Books, 2013. Kansteiner, Wolf. “Finding Meaning in Memory: A Methodological Critique of Collective Memory Studies.” History and Theory 41, no. 2 (May 1, 2002): 179–97. Kenny, Michael G. “A Place for Memory: The Interface between Individual and Collective History.” Comparative Studies in Society and History 41, no. 3 (1999): 420–37. Long, Seth. “Excavating the Memory Palace: An Account of the Disappearance of Mnemonic Imagery from English Rhetoric, 1550–1650.” Rhetoric Review 36, no. 2 (April 3, 2017): 122–38. Mack, Katherine. “Remembering Winnie: Public Memory and the Truth and Reconciliation Commission of South Africa.” In Global Memoryscapes: Contesting Remembrance in a Transnational Age, edited by G. Mitchell Reyes and Kendall R. Phillips, 133–58. Rhetoric, Culture, and Social Critique. Tuscaloosa, AL: University of Alabama Press, 2011. Murphy, John M. “‘Our Mission and Our Moment’: George W. Bush and September 11th.” Rhetoric & Public Affairs 6, no. 4 (February 3, 2004): 607–32. Olick, Jeffrey K, Vered Vinitzky-Seroussi, and Daniel Levy. The Collective Memory Reader. New York: Oxford University Press, 2011. Pereira, Ângela Guimarães, Alessia Ghezzi, and Lucia Vesnić-Alujević. The Ethics of Memory in a Digital Age: Interrogating the Right to Be Forgotten, 2014. Phillips, Kendall R. Framing Public Memory. Tuscaloosa: University of Alabama Press, 2004. ———. “The Failure of Memory: Reflections on Rhetoric and Public Remembrance.” Western Journal of Communication 74, no. 2 (April 1, 2010): 208–23. Pruchnic, Jeff, and Kim Lacey. “The Future of Forgetting: Rhetoric, Memory, Affect.” Rhetoric Society Quarterly 41, no. 5 (October 2011): 472–94. Reyes, G. Mitchell, Kendall R. Phillips, and Project Muse, eds. Global Memoryscapes: Contesting Remembrance in a Transnational Age. Rhetoric, Culture, and Social Critique. Tuscaloosa, AL: University of Alabama Press, 2011. Reynolds, John Frederick. “Concepts of Memory in Contemporary Composition.” Rhetoric Society Quarterly 19, no. 3 (1989): 245–52. Roediger, Henry L., and James V. Wertsch. “Creating a New Discipline of Memory Studies.” Memory Studies 1, no. 1 (January 1, 2008): 9–22. Sloane, Thomas O. “Memory.” Encyclopedia of Rhetoric. New York, NY: Oxford University Press, 2001. Sturken, Marita. Tangled Memories : The Vietnam War, the AIDS Epidemic, and the Politics of Remembering. Berkeley : University of California Press, 1997. Swadley, Charles R. “Remembering Memory: Reconfiguring the Fourth Canon of Classical Rhetoric,” 2008. Veil, Shari R., Timothy L. Sellnow, and Megan Heald. “Memorializing Crisis: The Oklahoma City National Memorial as Renewal Discourse.” Journal of Applied Communication Research 39, no. 2 (May 1, 2011): 164–83. Whittemore, Stewart. Rhetorical Memory: A Study of Technical Communication and Information Management, 2015. Wright, Elizabethada A. “Rhetorical Spaces in Memorial Places: The Cemetery as a Rhetorical Memory Place/Space.” Rhetoric Society Quarterly 35, no. 4 (September 1, 2005): 51–81. Zerubavel, Eviatar. Time Maps: Collective Memory and the Social Shape of the Past. Chicago, IL: Chicago University Press, 2003. Can you suggest some books for memory palace training or methods as I might not be able to read all of the books mentioned above, out of which many are about the history and the changes since then. Joshua Foer’s Moonwalking with Einstein is a fun popular book on the memory palaces.